Happiness is a hot pierogi: BSpot Yo! The wall o' beer cans at BSpot. I would like to help with the next. 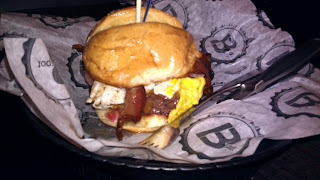 This weekend, I had a grand adventure visiting hometown hero Michael Symon's new BSpot joint in Strongsville. If you are a regular reader of my blog, you will know that most regular everyday situations for me end up being sitcom gold and this day was no different. Before I carry on, it is important to remember that while I don't consider myself a “foodie”, I’m a restaurant rat. I have worked in restaurants for more years than I am willing to share, as a server, bartender, manager, you name it, I have done it (don’t get me going on my schnitzel butter burns). I’m picky. There. I said it. I expect good service and a good product. If I get that, I’m your friend for life. If I don’t, well, that is best left alone. I made plans with my friends to go to lunch at BSpot. It opens at 11, we get there by 10:45 and we are happy campers. I wanted my friend to be there at 10:45, knowing she and her husband are always late and they would just make it by 11. Good thing I did because there was a line out the door for the place to open. I was giddy. Sure enough, my friends showed up at 11 as I was walking through the entrance. Since BSpot only seats complete parties, I was ready to go it alone if they weren’t there in time. Yes, I was that excited. The hostess sat us at a booth and we scooted in and opened our menus. And then the hostess told us we were at the wrong table and she scooted us out of our booth and then to another booth across the restaurant. We shrugged and followed her to table #2. I told myself that it wasn’t a sign of things to come. We ordered drinks and checked out the menu. When my soda arrived, I took a swig and it was flat as a crepe (see, I could have said pancake there, but a crepe is so much flatter). Balls of crap rolling down hill filled my mind. I didn’t like where things were going. I told myself that it was opening week, the place looks cool, so it was all going to be cool. I asked our server his recommendation for wings and he said the lime and cilantro ones were the best. He described them in great detail. Awesome we said. We’ll take them. So our food arrives and so does my soda (nice and bubbly thank you) and the wings have what appeared to be jalapenos on them. I looked at them. Looked at my friends. Looked at the wings then looked at the server. When he came by, I asked him if this was right. He looked at the wings then at me. 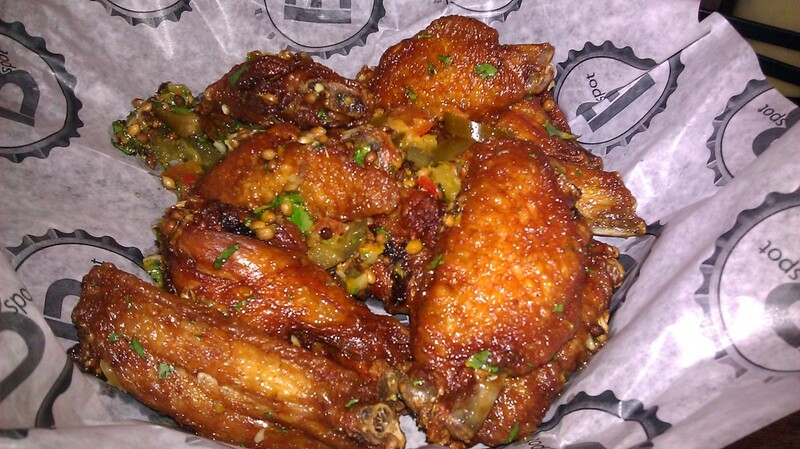 Then at the wings and at the kitchen. He said he didn't think so, apologized profusely and off he went. Again, I shrugged and started to dig in.I went with the Yo! burger burger with fried salami, coppa, hot peppers (I left those off, ick), provolone and shasha hot sauce. Before I go on, let me just say now, that this was the best burger I have ever chowed down on and I would eat it every day of my life until my heart exploded. I start tweeting away when a guy comes over to the table to tell us about our wings and how they come with the chilies but they are remaking them etc. I said, "No problem man, we just wasn't sure of those were right with the jalapenos and all." The guy was very nice and explaining everything. The man at our table was none other than the Iron Chef himself, one Mr. Michael Symon. Gulp. After he walked away, my face turned every shade of red imaginable. Whew. I giggled like a school girl. My friend got the Lola burger with fried egg, bacon, pickled red onions, cheddar and mayo which she proclaimed to be the best burger she had ever consumed. 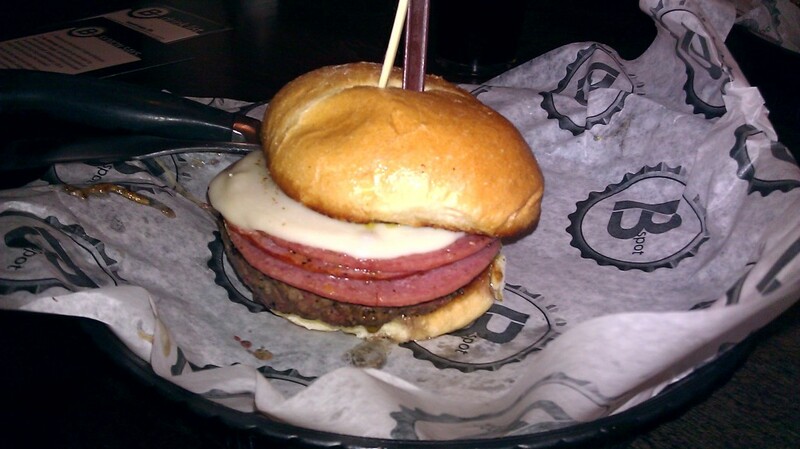 I tried it and I admit it was darn tasty, but she likes her burger with its hoofs on, so I stuck with my burger. Her hubby got a Stadium style brat, with you guessed it, stadium mustard on it. Yum. 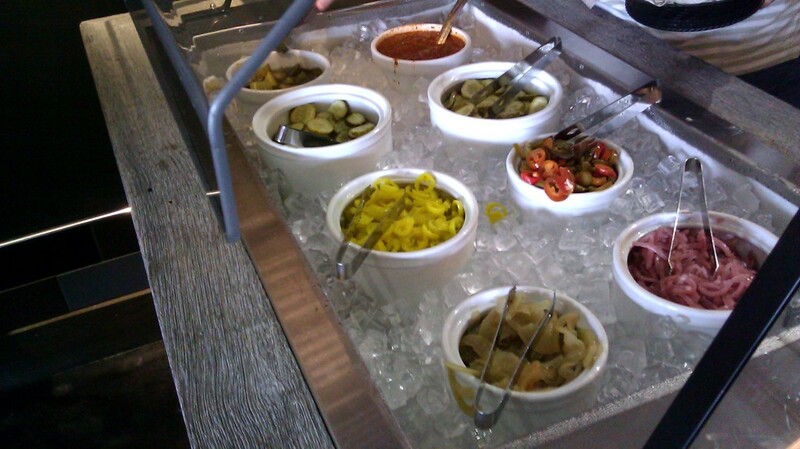 The other exciting thing about the place is they have a pickle bar. And it isn't just pickles, but it is things pickled. Pickled tomatoes, pickled onions, pickled pickles. 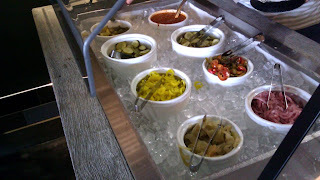 There was some amazing relish on there too, so be sure to try it all. 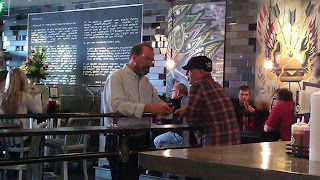 My stalker shot of Michael Symon chatting. Let's talk about Michael Symon for a second. First, I was amazed that he was in the place. I know he is from Cleveland, but seeing him on the Food Network, you forget that he is still one of us here in town. And he is one of us in case you were wondering. He was walking around the restaurant, talking to the tables, happily taking pictures with old and young alike and even clearing tables.He was naturally friendly, with no sneer as he walked away from people. I would say he genuinely enjoyed being there and chatting with the people. He joked with us about the opening week at Roast, his restaurant in Detroit. The place has huge rotisseries, with whole pigs, goats, you name it spinning around. A woman walked in, looked around and then passed out. Seems the woman was a vegetarian. We all got a good laugh about that. He talked a little about his family and his mom putting the kibash on him going to LA. It was like talking to your college roommate's awesome friend from back in the day. I know it is nerdy, but I shook his hand and said we were proud of him. Cleveland is proud of him. I think I took him back a bit, but it is true. We all know I get incredibly sentimental when talking about Cleveland and the fact that this guy loves the city too? He is a good egg in my book. Then I got off the mushy train and asked his recommendation for a milkshake. He looked at me and said, "You know what I'm going to pick." And I said, "Just checking" and chuckled. 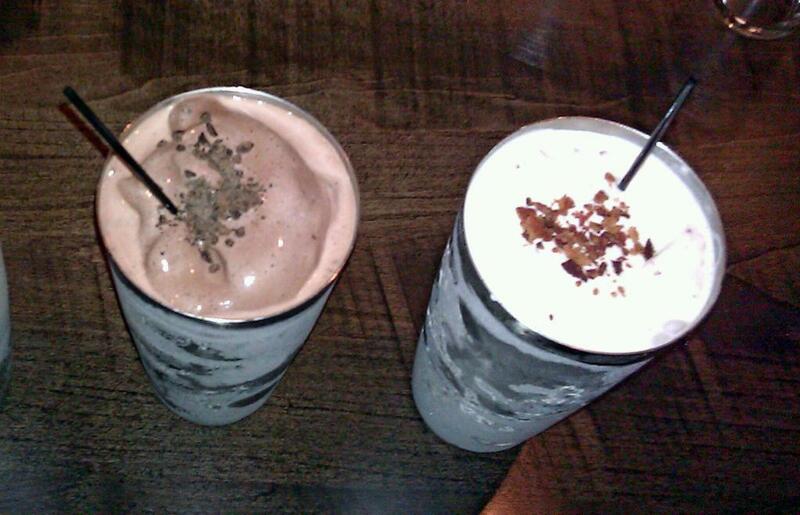 I went with the Vanilla Bean Apple Pie Bacon with Bourbon and my friend got the Chocolate Espresso with Frangelico. The milkshake was conceivably the best milkshake I have ever had and if I got hit by a bus on the way out, I would have died happy. I can't even describe how amazing it was. While there was booze in it, it wasn't so much that you were going to fall over. The flavors all mixed in ways I had never imagined. I say this with complete confidence, if you skip this shake, you are missing out and your life is not complete. My friend loved her chocolate shake and thought the espresso beans was a wonderful touch. The Frangelico added to the flavor and was very tasty. 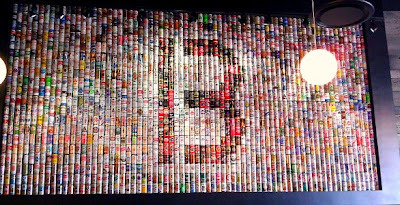 Overall, would I recommend BSpot? Without hesitation. The interior is cool and hip without being pretentious. The staff was friendly without being condescending. Strongsville is still the burbs and you will get people that have never even tried anything pickled other than a pickle, so a helpful staff is key. The food was a-maz-ing. The burgers are made out of the best meat money can buy and it shows. 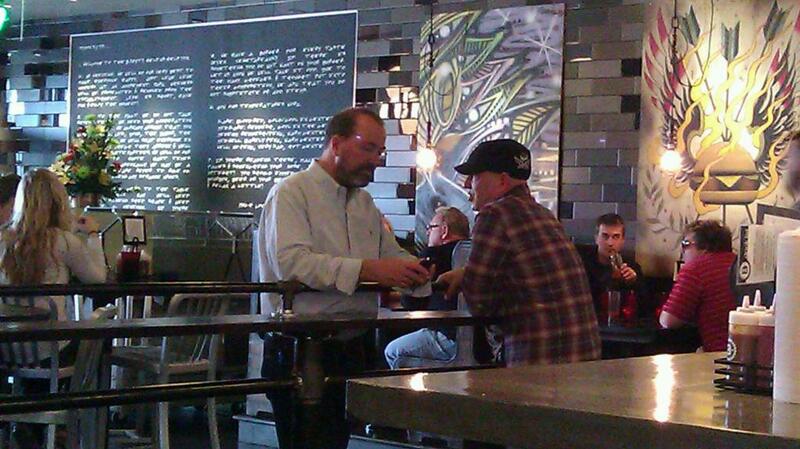 And seeing Michael Symon wandering around the joint? Well, that is an added bonus.